If you have a spiralizer then you can use it and get the job done quickly. If you don’t then you can easily use a vegetable peeler to make long thin strips with your zucchini and carrots. Wash basil, remove leaves from stems, and set leaves aside. Wash cherry tomatoes, slice in half, and set aside. Make cashew parmesan (or just always keep some on hand) and set aside. Make 1 batch of white bean alfredo sauce and either blend until hot or heat after blending. 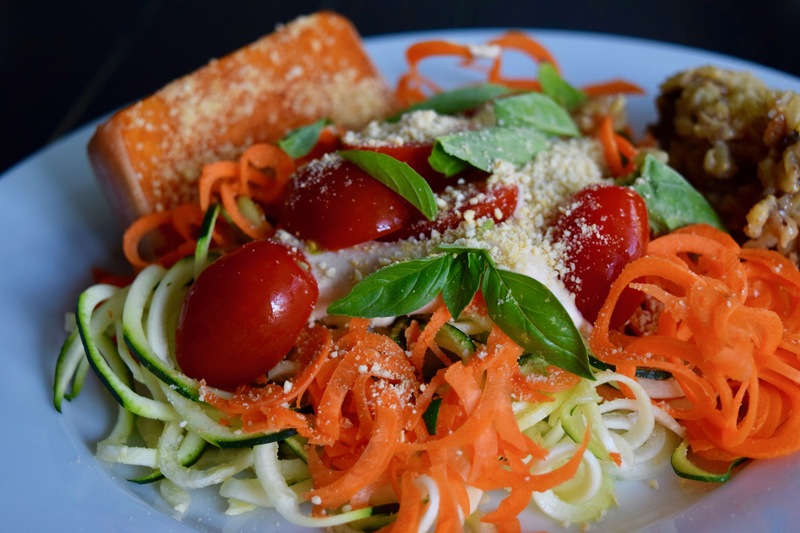 To Serve: divide carrot and zucchini zoodles into four. Top each serving with about 1/4 cup of heated white bean alfredo sauce, 1 tablespoon cashew parmesan, 1/4 cup cherry tomatoes, and several fresh basil leaves. Enjoy! This bowl also tastes great with a side of Mushroom Risotto, Baked Butternut Squash (with cashew parmesan), or Mushroom Risotto Stuffed Butternut Squash. This looks so nutritious, colourful and delicious – my three favourite things! YEAH for color and fiber and all things nice! That is such a cool machine, it really works!